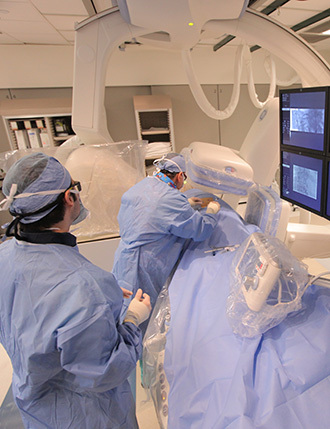 The Department of Neurosurgery at Weill Cornell Medical College offers a clinical research fellowship in Interventional neuroradiology (INR), a relatively new field that combines advanced three-dimensional imaging techniques with endoscopic surgical procedures. INR specialists are neurosurgeons with advanced training in radiology who perform minimally invasive endoscopic techniques using high-tech imaging equipment to guide their work. This two-year fellowship is under the direction of Dr. Athos Patsalides and recruits physicians who wish to participate in our clinical and experimental research. The clinical research is centered on patient outcomes, especially of the treatment of aneurysms, stroke, and intra-arterial chemotherapy. Our experimental research is centered on intra-arterial infusion with disruption of the blood-brain-barrier.